Is imitation the sincerest form of flattery? 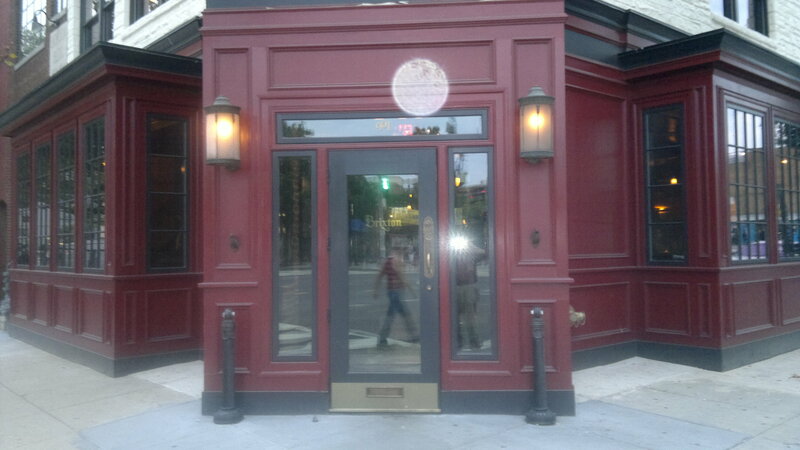 We decided to see if it was after noting a post on Urban75 (here) that there was a Brixton bar and restaurant in Washington. We were also interested in the ‘gentrification’ issues that the bars in this area had generated, as they seemed similar to those being discussed in Brixton blogs. The Brixton is a “concept” bar with food. It was opened by a company called Brixton that herald from San Francisco and they make clothes. We believe (the barman told us) that they were originally from South London. But this is not any part of South London that we have been in. The surrounding streets were part of a mainly black community (so that’s the same). In fact Obama chose Ben’s Chili Bowl which is just along the street from the Brixton to emphasise his black credentials and there is a monument to Afro-americans who fought in the War of Independence. The area is now being “gentrified” with new businesses mainly being run by white entrepreneurs – hence the discussion thread on Urban75. But what about “the Brixton” – is it really a home from home? The decor is heavy wood – more Scottish baronial than ‘edgy’ Brixton, even the light fittings seemed to be in the shape of antlers. London street signs are on the walls but very little else. Set over three floors the roof has an open air bar with a view across the city (you can just see the Washington Monument). The middle floor has TVs, sofas and a long bar while the bottom is the most sedate – a long bar and a restaurant area. The menu gets a little more Brixton – jerk chicken, burgers, fish and chip, sausage and chips but they also have petit beef wellington. We ordered the burger and the jerk chicken. 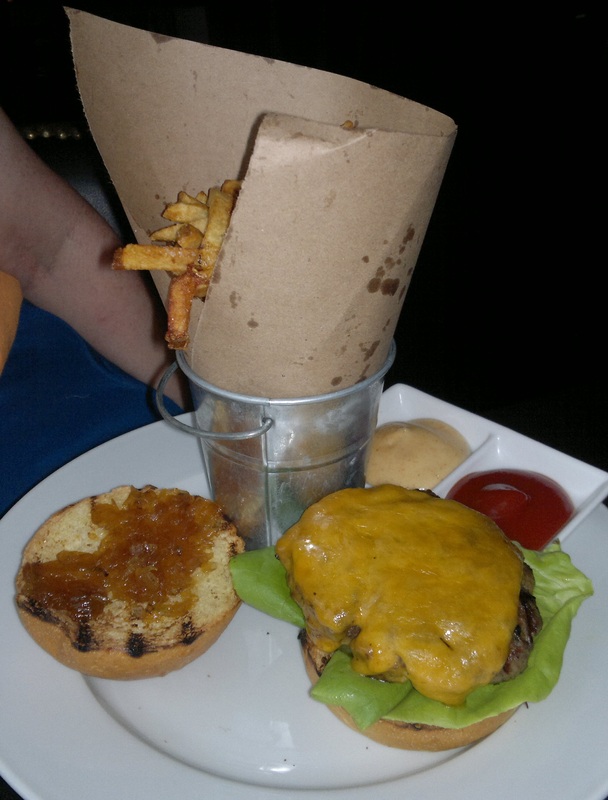 The burger came with a pile of “fries” which were thin and crispy, together with tomato ketchup and mayonnaise as well as onion jam. Unfortunately I had not noted the cheese which even if described as aged cheddar I don’t like – but it was pretty easy to peel off. The medium burger was really medium so if you want medium ask for medium rare. It was tasty and very easy to munch down, even though in the heat I hadn’t really been hungry. My partner had the jerk chicken which was nothing like jerk chicken in Brixton. For a start it comes with a lot of pesto and mango chutney. The chicken was not particularly hot but if it hadn’t been called jerk chicken it would still have been interesting and tasty but not what you would expect. But as well as being a restaurant the Brixton is a bar and in the early evening it was buzzing. The cocktails are interesting and not precise – the portions of gin were slopped rather than measured into the glasses meaning there was rather a lot of gin. My delicious and interestingly named “Riot Sling” – made up of Gordon’s London Dry Gin, Lemon, Honey, Harney & Sons Earl Grey and Ginger Beer was served with a hefty portion of ice and made me want to sleep very early on top of jet lag. My partner had the “Mind the Gap” which was described as Cardhu Scotch Whisky, Drambuie, Dry Vermouth, Aromatic Bitters and Lemon. The last ingredient was a piece of peel wiped around the rim and then dropped into the glass. All this too with a lot of ice. We had these first before we ate so we decided food was a must despite our lassitude. We had red wine with our meal – a glass each of Cabernet Sauvignon (the “cab” to our waitress) and a Pinot Noir. They were both really smooth and not at all different from each other but very palatable. There are beers to alleviate the homesickness with Boddington’s, Newcastle Brown, Bass Pale Ale, Black Sheep and even a Youngs double chocolate stout. So is this like Brixton? – no it isn’t but it is a good place to go. 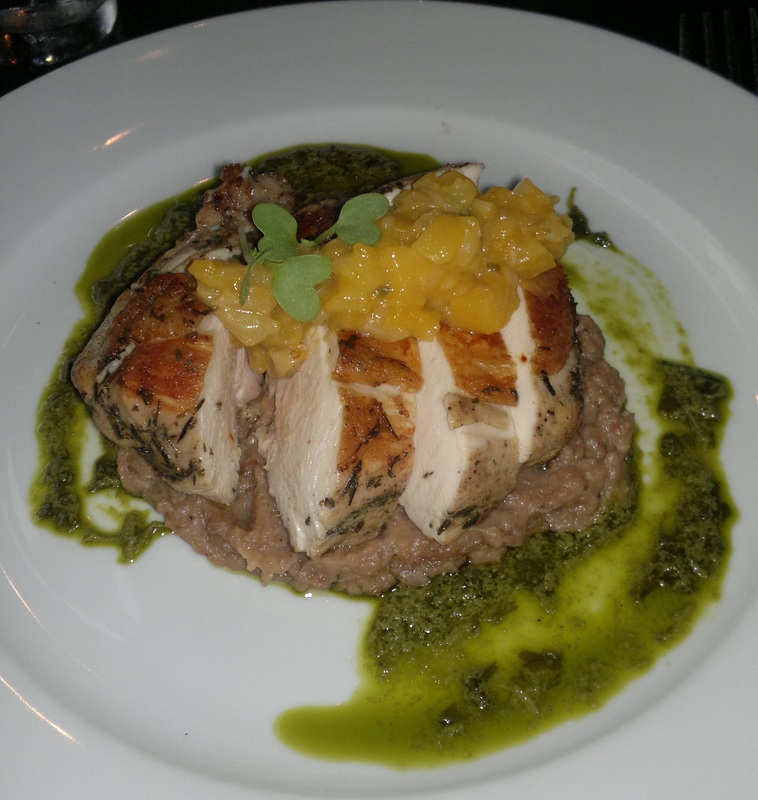 The food was very enjoyable and didn’t have too many flavours that are often found in upmarket restaurants in the USA. These often change the focus of the meal and make you confused. This isn’t cheap either – cocktails are between $9 and $12 and the main courses from $14 to $25 and that doesn’t include the expected 20% tip. But is this like Brixton in the influx of white run businesses – probably it is. But unlike Brixton the clientele of the Brixton is mixed – much more mixed than in Brixton Village where the main group is white. In Washington the friendship groups seem to be around age rather than ethnic group – we hope that in London the same thing really develops to ensure our Brixton is available to everyone.